Hey everyone, most of you are probably well informed of this event by now, but for those who are just doing it for a first time, this is a good starting place! 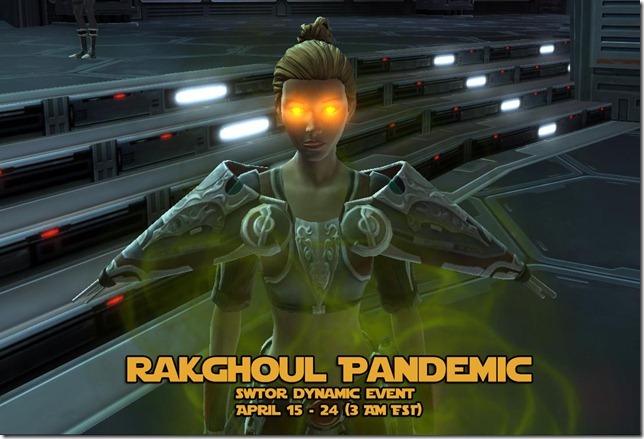 The Rakghoul Pandemic a new dynamic event that started on April 15 on the planet of Tatooine. It involves a series of time limited quests about the Rakghoul plague! The rewards you obtain from this event are a title (Containment Officer prefix), 9 Codex entries, 2 Rakghoul vanity pets (Pale and Crimson) a full set of Containment Officer armor set (light armor), special Black Green color crystal, and infected Companion customizations! This event is not restricted to 50s only. All of the quest mobs do scale to your level but beware that if you are too low to enter Tatooine, you might have a bit trouble with the local residents.